After two years learning with The Cooperative Irène went on to the College Sevigne, and then to the Faculty of Science at the famous Parisian college, The Sorbonne. Unfortunately just as her studies were getting underway the First World War broke out. At just 17 years old Irène was sent to the countryside where it would be safer, however she didn’t stay out of harms way for long. She soon joined her mother in establishing and running mobile x-ray units for wounded soldiers. Irene helped her mother to create 20 mobile x-ray vehicles and another 200 units at field hospitals during the first year of the war. They also began to train other women in how to use the technology. When the war ended Irene was able to resume her studies, this time at The Radium Institute(which her parents had founded!) She became a Doctor of Science in 1925. In 1926 the pair married, and instead of becoming Mrs Joliot, they decided that they would both adopt each others names, becoming the Joliot-Curies. They began working together in the field of chemistry & radiography building on the work that Irène’s parents had done. In 1934 they made several important discoveries to do with changing one element into another. It was this work that won them the Nobel Prize in Chemistry the following year. (This made the Curies the family with the highest number of Nobel Prizes!) Irène was made a professor at The Sorbonne and the couple became quite famous in the scientific world. Irène opposed the fascist movement that had gained popularity in some parts of Europe, joining the Socialist Party in 1934 and supporting freedom fighters in the Spanish Civil War. In 1936 she was made Undersecretary of State for Scientific Research by the French government . Just as her parents had, Irène & Frédéric used to make all of their work public. However, as the Second World War began they decided that some of their research could be very dangerous in the wrong hands. They locked all their research into nuclear fission in the vaults of the French Academy of Science, where it stayed until 1949. After the war had ended Irène was made the Director of The Radium Institute and continued to inspire other scientists. She was also a great champion of women’s rights, especially in advocating for education for women. Later in her life she joined the National Committee ofthe Union of French Women, and also served on the World Peace Council. Sadly, as had been the fate of her mother, Irène’s body had been badly affected by the radiation she was exposed to in her work. She developed leukemia and eventually died from it in 1956, aged 58. 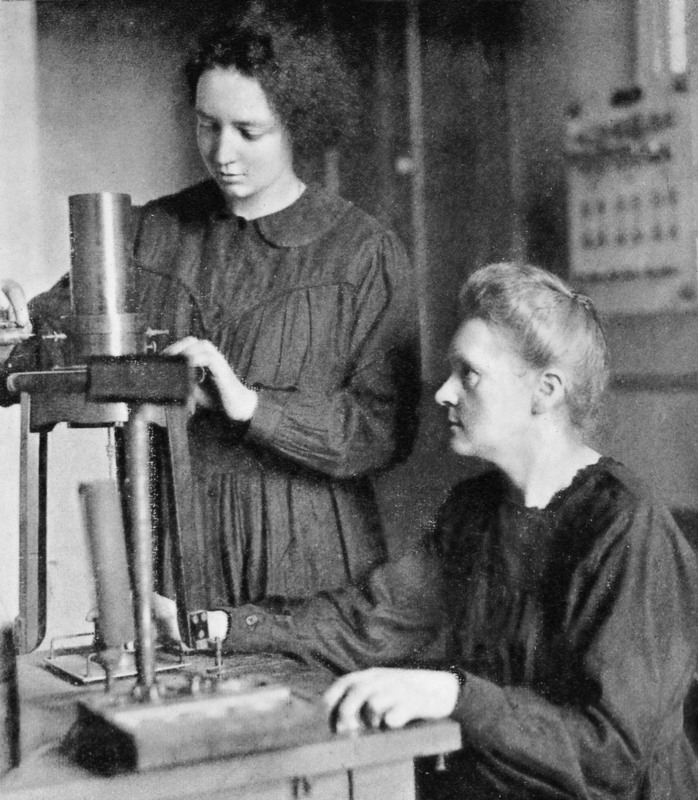 Today many people have probably not heard the name Irène Joliot-Curie, although most will have heard of her mother. Her name is remembered in one unusual place however; there is a crater on Venus which is named after her (bizarrely it seems that there are quite a few craters on Venus named after Sheroes of History! Have a look here.) There is also an annual Irène Joliot-Curie prize given in France to exceptional women in science. You can read Irène’s acceptance speech for her Nobel Prize here. There are a couple of books about Irène. This one and this one are both available, but are both in French so only for those fluent in the language! This post originally appeared on the Sheroes of History blog. Sheroes of History is an exciting project telling the fascinating stories of history’s forgotten heroines. The aim of the blog is to raise the profile of these incredible women and provide a broad range of inspiring role models for girls growing up today. If there is a Shero you would like to write about for the site you can get in touch and submit your idea. Follow Sheroes of History @SheroesHistory and like them on Facebook for loads more women’s history updates! This entry was posted in Blog, Engineering and tagged First World War, Irène Joliot-Curie, male Nobel Prize winners, Marie Curie, Nobel Prize for Chemistry, Radiography, Second World War, Sheroes of History, Women Scientits, Women's History, World War 1, X-rays. Bookmark the permalink.